Welcome to Savannah, the cultural heart of the South. Here, you can walk streets and squares established in 1773, admire elegant architecture, explore popular museums, shop in local boutiques, and dine at world-famous restaurants. There’s something for everyone in The Hostess City of the South. Hop on an Old Town Trolley Tour, take a carriage ride, or simply walk the beautiful streets of Savannah’s Historic District. There are so many things to see and do in Savannah, you’ll be planning your next visit in no time! This expansive park surrounded by some of the city’s most charming homes is perfect for an afternoon in the sun. 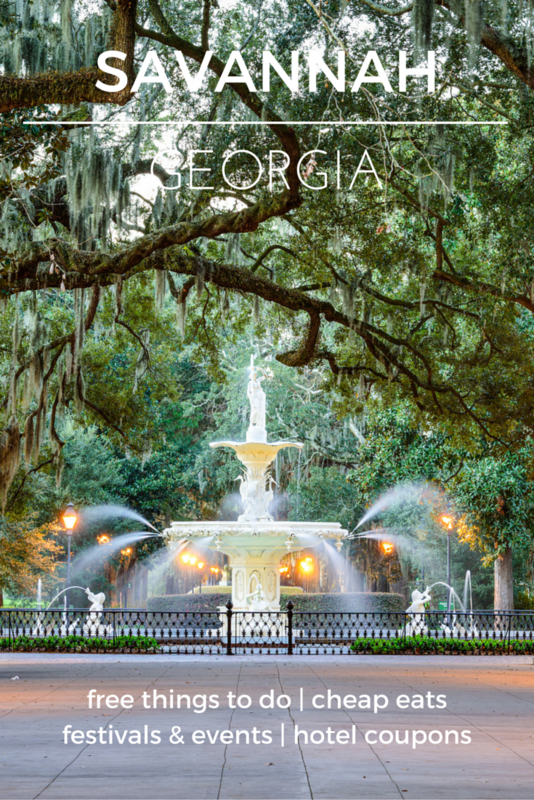 Don’t miss Forsyth Park Fountain, which will remind you of the famous Place de la Concorde in Paris. You don’t need to break your budget to enjoy City Market! Perfect for window-shopping, walking, and people watching, add this “social center” to your itinerary. Take a short drive to Tybee Island to spend a day in the sand the surf. This closest beach to Savannah provides a wonderful destination for shelling, swimming and sunning. One of 22 beautiful squares in Downtown Savannah, Chippewa Square is home to the famous bus stop bench from the film, Forrest Gump. Just six miles from Downtown Savannah, this wildlife refuge spans more than 29,000 acres and is home to thousands of birds, alligators and more. Enjoy hiking, fishing, biking and photography. Take a romantic stroll through the stunning Savannah Botanical Gardens. The vibrant colors and quiet ambiance of the garden and historic Reinhard House offer a wonderful escape from the busy tourist areas. Originally home to Bonaventure Plantation, this cemetery offers a scenic views, impressive sculptures, and tree-lined paths. It was also featured in the John Berendt novel, Midnight in the Garden of Good and Evil. Simply seeing the outside of this famed theater is worth a stop, but you’ll find even more to love in the theater lobby. The walls are lined with photographs and artifacts that tell the story of the theater’s rich history, which includes performances by legends like Lillian Russell, Oscar Wilde, W.C. Fields and many more. View the magnificent architecture, murals and stained glass of the cathedral on East Harris Street. Built in 1876, this is the oldest Catholic church in Georgia. This small park along the Savannah River offers a perfect view of passing boats and is ideal for a quiet picnic. Experience performances, activities and exhibits that celebrate the contributions of African Americans to history and culture. Festival events are all free to attend. Book worms and creative writers alike will enjoy this free festival in the heart of historic Savannah. Celebrate Saint Patrick’s Day in Historic Downtown Savannah with music, street performers, military participation and more! The parade lasts three hours. This year, the Savannah Music Festival is celebrating its 25th anniversary! View concerts every genre, including folk music, jazz, dance and R&B at 10 venues around the city. Support local artists by appreciating art exhibits to performances of dance, theater and music, and more. View some of the most remarkable homes in the South when you join the Savannah Tour of Homes & Gardens. This annual event began in 1935 and continues to welcome visitors from around the globe. There’s no fresher way to appreciate local seafood than by sampling from the award-winning vendors at the River Street Seafood Fest. Explore the cultures of Asia through cuisine, performances, workshops and more. Commemorate Independence Day in Savannah by attending an annual celebration, including art exhibits, music and entertainment, food and fireworks. Savannah’s version of the renowned German festival, Oktoberfest, promises a great time. Featuring German cuisine, a beer garden, bratwurst tasting, and more, you won’t want to miss this event. Experience the food, culture, dancing and fun at Savannah’s Greek Fest. This special holiday-theme tour of historic homes in Savannah offers a unique opportunity to see many homes decked for the holiday season! Get into the holiday spirit with the Boat Parade of Lights, Christmas on the River, and The Savannah Harbor Festival of Lights. Free Museums in the U.S.